Brand new in 2016, you can be assured of the comfort and luxury of our lodge. With modern contemporary furnishings and a spacious open plan layout, it really feels like a home from home. The lounge has an attractive electric stove fire for cosy nights in and a smart Panasonic flat screen television, Blue Ray/DVD player and Bluetooth sound system are available for your use. Relaxing and dining in the lodge is a great experience as you enjoy the picturesque view from the large front windows. The country-style spacious kitchen is fully equipped with a fridge, freezer, dishwasher, microwave and double oven/grill to make eating in easy. The handy breakfast bar is a great place to enjoy your morning cuppa and read the newspaper! The utility cupboard by the front door houses a washer/dryer and is perfect for storing shoes and outdoor gear. The stylish master bedroom has a comfortable king size bed, mirrored dressing area and plenty of wardrobe space. This room benefits from an en-suite bathroom with thermostatic shower. The second bedroom is a twin and is just as stylish offering a practical, spacious walk-in wardrobe and mirrored dressing area. Both bedrooms have wall mounted smart Panasonic flat screen televisions. The master bathroom adjoins the second bedroom and is fresh and modern with a shower over the bath. 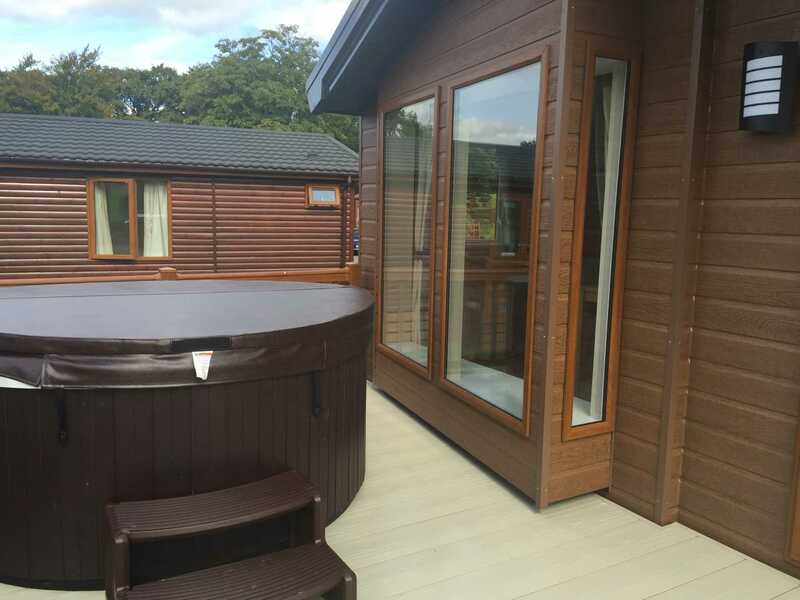 Let’s not forget outside where you can enjoy the top quality hot tub on the decking (which is anti-slip if you have little ones!) while taking in the Welsh mountain view and all the peace and quiet that Pen-y-Garth Park has to offer. If you fancy some outdoor cooking, we have provided an Outback barbecue with all the necessary cooking utensils (you just need to provide the charcoal). Sleeping four, our lodge is practical, stylish, centrally heated, well equipped, and very comfortable, making it ideal for a short break or longer stay.